The Buffet Prodige and Buffet Premium clarinets are the new generation of student clarinet from Buffet. Released officially in early 2016 (though production delays saw a true US market launch in late 2016), the new Buffet Prodige and Buffet Premium replace the longstanding Buffet B12 (and B10) models of student clarinet. The question though that many have asked me is “Why?”. Why did Buffet discontinue the B12 in the first place…. “that was a great student clarinet!” they would exclaim… and they were right. While Buffet has not publicly declared the why to this all, I think I can shed some light on the decision for you as well as help you figure out the difference in these two new models that form the next generation of Buffet student clarinet: the Buffet Prodige and Buffet Premium. Buffet is arguably the foremost authority in the clarinet world. Love them or hate them, the simple fact of the matter is that Buffet holds a dominance in the clarinet world over all of the other brands. In the professional sector, the Buffet R13 has been the defacto clarinet of choice for virtually all professional clarinetists at some point in their careers. However, in the student range, Buffet’s long-held dominance with the Buffet B12 had become challenged by the improvement in build quality of the low-cost Asian (China primarily) market. With many other major manufacturers moving their own student production to Asia due to cost savings, Buffet was in a precarious situation of wanting to provide the student clarinet of choice while also maintaining affordability in a market segment that has been in a race to the bottom in price/affodability. With the B12 being made in Germany, the manufacturing costs associated with it must have hit a point where Buffet was not able to maintain the quality / performance / cost ratio that they felt necessary to keep the product competitive on the market. In January 2016, Buffet announced to US dealers that they had decided to discontinue the B12 student clarinet. They showed dealers prototypes of the primary replacement model, the Buffet Prodige and also informed dealers of the intent to release as well the Buffet Premium. The two models were being released in the US market (the US market setups will vary from other markets around the world) to meet the different needs of US dealers. With the Buffet Prodige, Buffet is targeting the “brick & mortar” dealers by not allowing the Buffet Prodige for e-commerce sales. With the Buffet Premium, they were offering a model to meet the needs of dealers who do sell on-line. 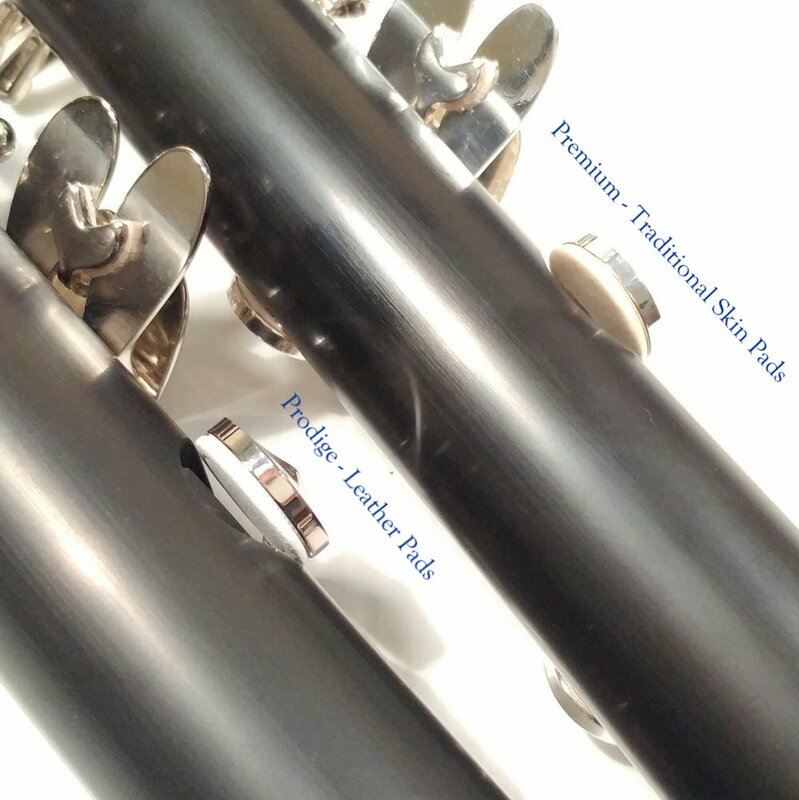 These two models are very similar clarinets with a few “packaging” differences to separate them from each other. However, these differences can be confusing to the consumer… hence this blog post. 🙂 Since my family’s music shop is a Buffet dealer that is both a “brick & mortar” store as well as an e-commerce dealer, we have access to both instrument models (though we still only will offer the Buffet Premium model for online sales… which you can purchase by clicking here – shameless plug, I know). 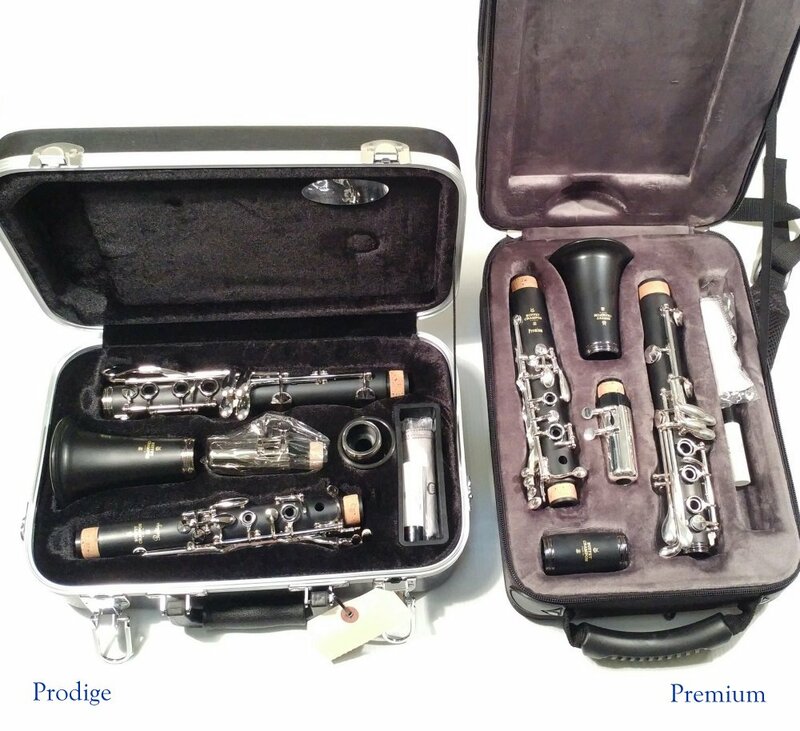 The Buffet Prodige and Premium are both virtually the same overall clarinet. They are actually products of 3 different countries on 2 different continents. In order to stay affordable, some of the manufacturing had to be sourced to China. However, unlike other major makers, Buffet did not move 100% of the clarinet to China. They also do not outsource the Chinese production to another company. Instead, Buffet invested in their own manufacturing facility in China that they could tool, setup and train in the Buffet methodology of manufacturing. This factory is responsible for the keywork, plating, assembly & padding of both clarinets. The bodies however are not Chinese… and this is where it gets interesting. The body joints are first molded from plastic in Buffet’s workshops in France. The bore of the instrument is said to be derived from the recently redesigned Buffet E13, a semi-professional clarinet (immediate step below the R13). This molding in France allows the Buffet Prodige and Premium to have its acoustic design closely controlled and regulated by Buffet directly, including the implementation of a unique “Textured Bore” inside the bell of the clarinet, which Buffet says helps the student clarinet optimize projection. This process, while expensive to initially setup, is relatively low cost to put in to production after the initial costs. 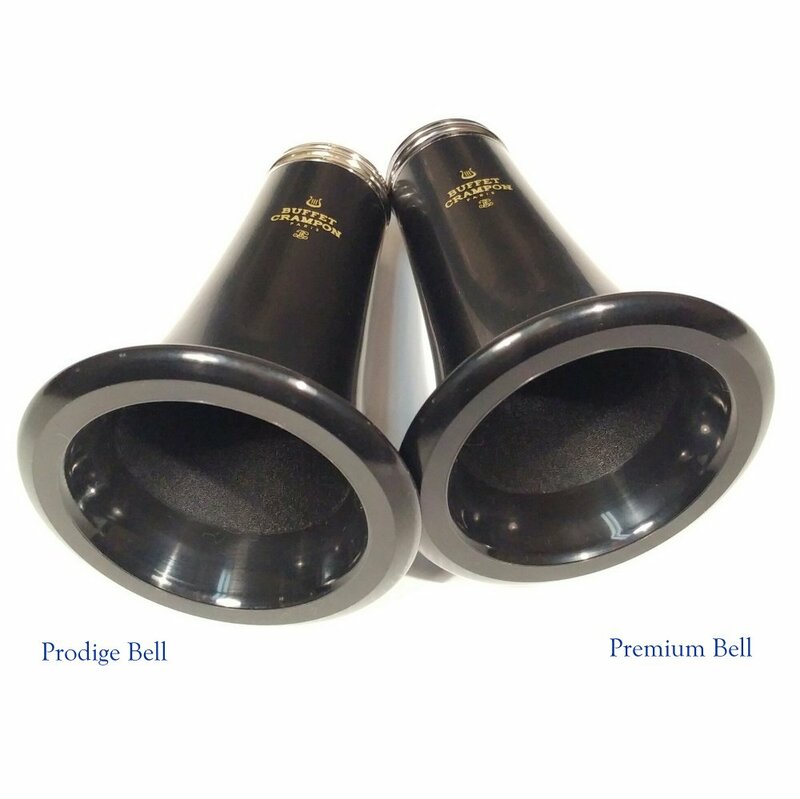 This helps the Buffet Prodige and Premium to maintain the Buffet sound while staying in the student price. Once moulded, the joints are then shipped from France to Buffet’s facility in Germany where the previous B12 models and current E11 models (as well as the keywork for the E12F) is made. The German factory is responsible for the precision drilling and shaping of the tone holes and their profiles. Like the molding process, this has a high initial costs but the long term cost is relatively low per unit once in place again allowing for Buffet’s desired quality while maintaining the market’s desired price. It is at this point that the Buffet Prodige and Premium are both sent to Buffet’s new facility in China to complete their manufacturing. Up to this point, the 2 instruments are the same instrument, but that doesn’t last for much longer. Please note that the following configurations are the ones offered in the US market. 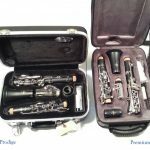 It is interesting to note that on Buffet’s official website, at the time of this blog post, that only 1 model of student plastic clarinet shows up: the Buffet Prodige. 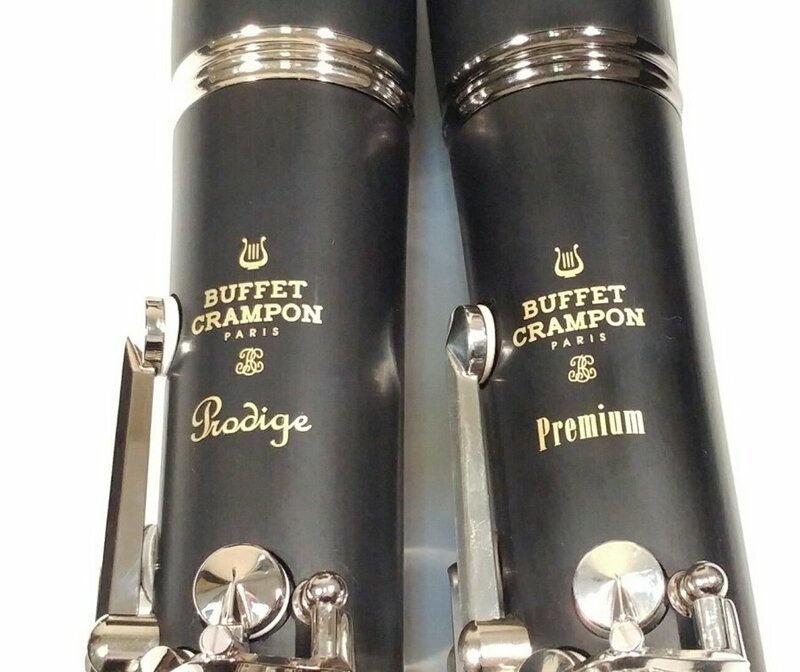 On Buffet’s listing of the Prodige, many of the configuration features of the Premium are listed as options on the Buffet Prodige as well as the option for a left hand Eb lever. However, in the US market, the options listed on the Buffet website are not available (at the time of this post). I would surmise that Buffet-Crampon in France allows their different distribution companies around the world to choose how these clarinets are marketed in their respective region. However, since we are based in the USA, and my blog primarily targets the USA readership, I am focusing on the configurations available in the US market only. If you are outside of the US, you can still infer a lot of understanding from this post, but your configurations and options may vary from what I show here. For the full Buffet official description of the Buffet Prodige, please feel free to view it on the Buffet-Crampon website by clicking here. As mentioned above, neither clarinet is really “better” than the other. Some will argue this however as they will point to one specific feature as their point of contention: the leather pads on the Buffet Prodige. It is a commonly held belief that a leather pad will produce a warmer tone than a traditional skin pad as well as offer a longer life expectancy than a traditional skin pad. To be honest, I personally believe this to be overall true as well. However, there is a downside as well to these pads especially when in relationship to the fact that they are on a clarinet that has a target market of students. Leather pads on a synthetic body can very easily and quickly become stickier than a traditional skin pad. Considering that most students tend to do a poor job cleaning and maintaining their clarinets, this has the potential to become a nuisance to their parents (since the parent is the one who has to drive it into the repair shop when there is an issue). However, if maintained properly (swab out your clarinet after every single time you play it), the leather pads will have a longer life expectancy generally which can be a very good thing. The key plating also being different can be a pro or con to an individual depending on their preference. On the Buffet Prodige, traditional nickel plated keys were chosen in order to keep the cost down. Nickel also has a tendency to wear off easier than silver. So while the pads might last longer on the Buffet Prodige, the key plating (under the same wear/use) will not last as long on the Buffet Prodige when compared to the silver plated keys on the Premium. These silver plated keys bring the additional durability to the Premium but obviously also bring an increase in the cost. On the downside, silver plating brings the added nuisance of tarnishing/cleaning. I find it an interesting choice though that Buffet opted for black tenon rings with the Silver keyed Buffet Premium. I’m sure they thought his would “look cool” but personally I find it kind of silly. Personal preference I suppose. Lastly, the case is obviously different. 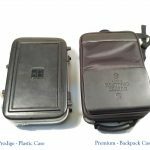 With the Buffet Prodige, a basic plastic case (for the US market at least) was chosen. I believe this choice was put to coincide with the fact that the Buffet Prodige is not for e-commerce sales hence targeting the traditional music retailer rental concept. Putting the Buffet Prodige in a plastic case bodes better for rentals. This case is the same case that was last used on the Buffet B12. 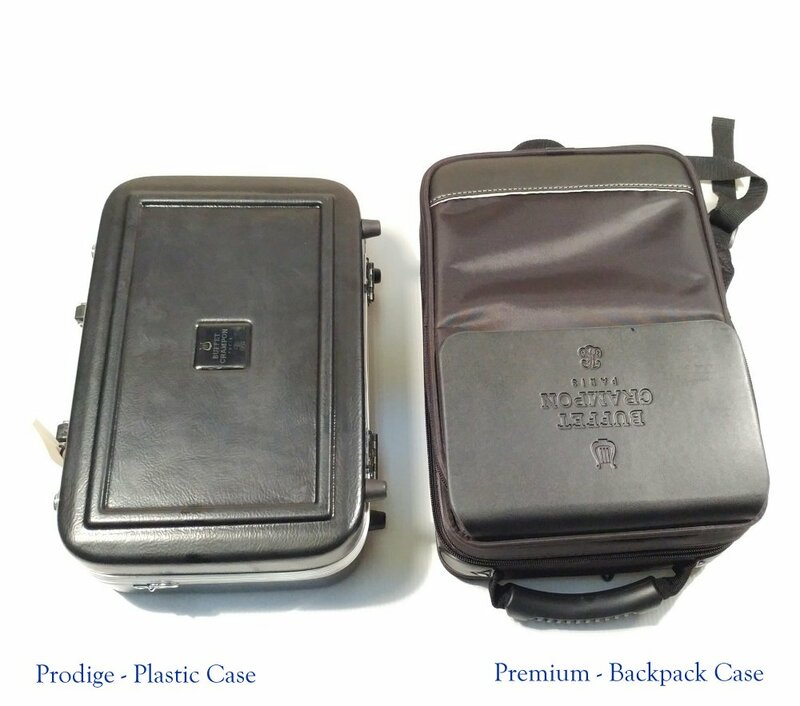 On the Buffet Premium, a nicer quality backpack style case was chosen. Its a very nice case overall and I am sure was part of the “look cool” concept that paired the black rings with the silver keys. So there you have it. 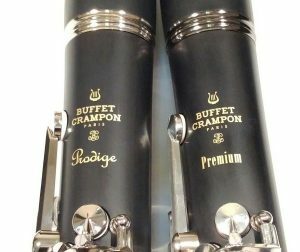 You are now fully schooled on the difference between the Buffet Prodige and the Buffet Premium, next generation student clarinets from Buffet-Crampon. They are both solid successors to the Buffet B12 and will serve a student well until they are ready for their next clarinet… which of course Buffet wants to be another Buffet clarinet… and of course if you are going to buy a new Buffet, I think you should definitely get it from a shop that knows a thing or two about clarinets… maybe a little shop in Las Vegas named Kessler & Sons Music? Just throwin’ it out there. This entry was posted in Clarinet, General, Product Reviews, Woodwinds. Bookmark the permalink.